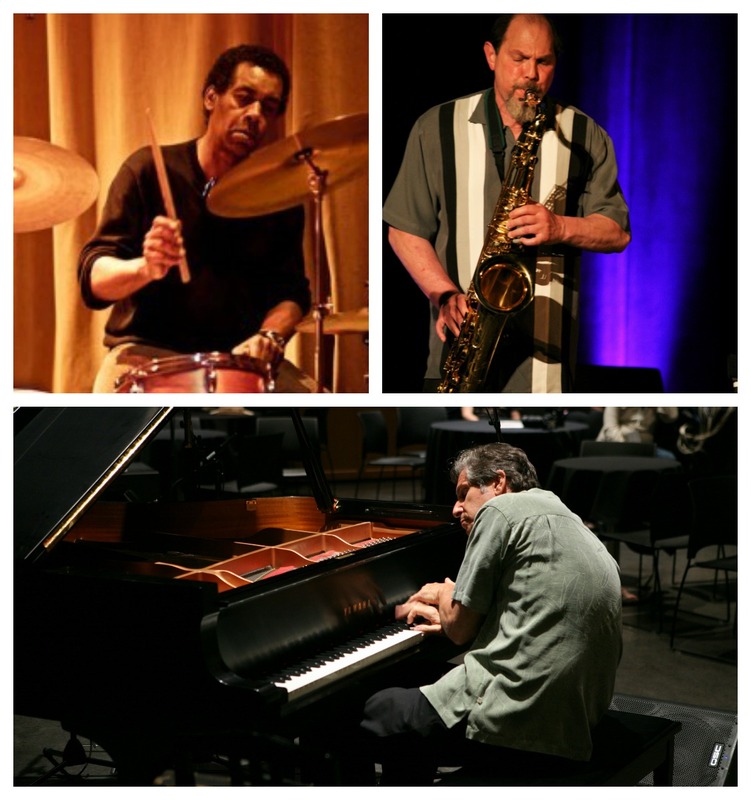 The Joel Futterman New Alchemy Trio featuring reed player Ike Levin and drummer Donald Robinson is dedicated to exploring new directions in the art of “in the moment” collectively composed and improvised music. While many of concepts of what was referred to as avant-garde jazz back in the early 1960s are referenced by the Trio, they are determined to redefine and redirect this musical form by stretching the boundaries of tonality, timbre, harmony, rhythm and even compositional form itself. Their compositions are never preconceived, predetermined, or rehearsed. Each is developed spontaneously. Compositional coherency is achieved and cultivated through deep listening and highly attuned responsiveness to each other’s musical phrases as each is connected with, resolved, and developed. This is a tight, creative, musical unit whose hearts and ears are open to each other. Noted Village Voice music critic and commentator Nat Hentoff described Joel Futterman as “a musician in full communication with himself and others with a near boundless reservoir of imagination.” Howard Reich, music critic for the Chicago Tribune portrayed Futterman as possessing “incredible musicality, inventiveness, and expressiveness,” and recommending him “for those who value jazz experimentation at its most audacious and fiercely committed.” Known for his spirited, highly imaginative, and radical piano technique, Joel Futterman is internationally acclaimed as a veteran pioneer into the frontiers of spontaneous, improvised music. He is considered one of the foremost inventive and adventurous artists shaping the creative, progressive jazz music scene today. He began his piano studies at age 9 in Chicago. While growing up in Chicago he had the opportunity to experience live performances of such notable jazz artists as Miles Davis, John Coltrane, Eric Dolphy, Charles Mingus, and Thelonious Monk who all exerted influence on him. As a young adult, he relocated to the relative isolation of Virginia Beach, VA, where he still resides today, seeking the solitude he believed would aid his quest to develop his own distinctive musical voice. He took a self- imposed sabbatical from performing and recording for nearly a 7 year period during the late 1970s and early 1980s to absorb himself in a highly demanding 8-10 hours a day practice regimen. From this deep learning experience, he was able to extend a full independence between his right and left hands on the keyboard, as well as cultivate a cross over technique that allows him to create musical phrases and ideas not available using more conventional piano methods. Futterman’s music spans the depths of lyricism and beauty to the heights of raw emotionalism. From blistering tempos, where musical ideas are fired off at mind boggling speed, to more ballad like movements emphasizing the use of space, rich harmonic structures, and overtones. Transitions between musical ideas occur nearly flawlessly so they are not recognizable until the change is complete. There is such potent coherency to his musical work that is incredulous to grasp that none are pre-conceptualized or “pre-scored.” Futterman’s near boundless reservoir of musical ideas do not succumb to the comfort of clichés or formulaic patterns even as he pays tribute to jazz musician geniuses of the past. Instead, he displays remarkable courage as he continually searches and probes forward in unexplored territory. His musical quest is as much an adventure for Futterman as it is for the listener. Futterman has performed across North America and Europe at such noted music festivals as The Vision Festival in New York, New Orleans Jazz & Heritage Festival, Tampere Jazz Festival in Finland, Guelph Festival in Ontario, Canada, and the North Sea Festival in Denmark, as well as smaller concert halls and listening venues. He has performed and recorded numerous notable jazz innovators including Jimmy Lyons, Joseph Jarman, Richard Davis, William Parker, Alvin Fielder, Paul Murphy, Hal Russell, and Matts Gustaphson. In addition, he has had long and productive partnerships with tenor saxophone players Ike Levin and the legendary Edward “Kidd” Jordan. Futterman has compiled a discography of over 60 recordings on such diverse labels as Ear-Rational, Konnex Records, Silkheart and Charles Lester Music. And he is the author of three books. Futterman is making one of his infrequent appearances in the San Francisco Bay Area so don’t miss this rare opportunity to listen and experience this remarkable musician in live performance. Buckle up, close your eyes, let your own preconceptions fade away, and get ready to go on a musical journey of varied impressions, images, and emotions. The music publication Coda described drummer Donald Robinson as a “percussive dervish” and “master of the drums.” He is a stalwart of the San Francisco Bay Area avant-garde jazz scene, playing and recording with many of the area’s top improvisational players, from saxophonists John Tchicai, Marco Eneidi, Larry Ochs, and Ike Levin to koto player Miya Masaoka and pianist Matthew Goodheart, as well as partnering with prominent visiting artists like Cecil Taylor, multi-instrumentalist Wadada Leo Smith, trombonist George Lewis, trumpeter Raphe Malik and Canadian pianist Paul Plimley. His frequent work with bassist Lisle Ellis was described by Jazz Times as ‘the best bass-drums tag team on the scene.” His longest musical association, dating from the 1970’s, was with the late tenor saxophonist Glenn Spearman. Robinson was born in Boston, Massachusetts. He first studied classical percussion at the New England Conservatory of Music. During the early 1970’s he served his musician apprenticeship in the jazz world of Paris, studying with Kenny Clarke and playing with Alan Silva, Anthony Braxton, Oliver Lake and Bobby Few among many others. He first played with Spearman as a duet partner during this period in Paris, an association which continued until the saxophonist’s death in 1998. Robinson plays currently in many configurations with a broad range of musicians throughout Europe and the US. He has amassed a discography of over 15 recordings.